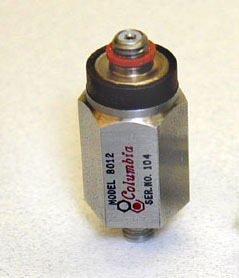 The Models 8011 and 8012 Piezoelectric Accelerometers are designed for the measurement of high frequency, moderate to high-level shock and vibration. They incorporate a hybrid electronic assembly within a rugged, welded, double-wall stainless steel body to enhance operation in humid and dirty environments. 2 Referenced to Sensitivity @ 100 Hz. 3 Unit is Hermetic Sealed.